Observational support for Lindzen’s iris hypothesis | Climate Etc. The new Mauritsen and Stevens paper (discussed in the companion post by Rud Istvan) is breathing new life into Richard Lindzen’s iris hypothesis. The tropical atmosphere consists of moist and cloudy regions associated with large-scale rising motion, convective storms and pronounced precipitation on the one hand, and dry and clear regions with subsiding motion on the other hand (Fig. 1). The atmospheric circulation maintains an approximate balance between radiative cooling, which occurs preferentially in the dry and clear regions, and latent heating from the condensation of water vapour in precipitating clouds. In the tropics, radiative cooling predominantly occurs in dry and clear subsiding parts of the atmosphere. The radiative cooling is balanced mainly by latent heat released in precipitating deep convective clouds (Fig. 1). Processes that may change the balance in favour of dry and clear regions in warmer climates have been proposed to constitute a possible negative feedback not represented by climate models. This potential feedback has been termed the iris effect, in analogy to the enlargement of the eye’s iris as its pupil contracts under the influence of more light. The controversial ‘iris hypothesis’ proposes that the fraction of the dry and clear regions could increase with warming and exert a negative feedback: a larger extent of the dry and clear regions would lead to a less cloudy upper troposphere and hence an increase in OLR. Such an effect could mitigate against climate change [by reducing climate sensitivity]. But a drier upper troposphere would also allow more solar radiation to be absorbed by the Earth and atmosphere, rather than reflected back to space by the clouds, so that the net effect of reducing high clouds is not obvious. On balance, the effect is thought to be negative. The estimate of climate sensitivity with an iris effect, however, depends not only on the rate of reduction of high-level clouds, but also on the cloud optical properties of the most sensitive clouds. If the thinnest clouds are preferentially removed, the effect on outgoing longwave radiation is stronger than that on reflectivity, and the iris effect is stronger. On the other hand, if the reduction in cloud cover affects thicker clouds more strongly, the loss in reflectivity plays a more important role, and the iris effect is less pronounced. Richard Lindzen has provided me with 2004 ppt presentation [Lindzen iris] that provides a good overview of his ideas re the iris hypothesis, and also the critiques of this hypothesis. So, what was the result of these criticisms that were clearly made in the absence of any serious attempt to understand LCH [the original iris hypothesis paper]? In the environmental literature as well as in papers by scientists like Jim Hansen and Steve Schneider, LCH is accompanied by the adjective discredited. TRANSITIVE VERB: Inflected forms: dis-cred-it-ed, dis-cred–it-ing, dis- cred-its 1. To damage in reputation; disgrace. 2. To cause to be doubted or distrusted. 3. To refuse to believe. NOUN: 1. Loss of or damage to one’s reputation. 2. Lack or loss of trust or belief; doubt. 3. Something damaging to one’s reputation or stature. I would suggest that this is an unusual word to use in connection with a serious paper. The vociferous objections to the iris hypothesis arises not so much from the hypothesis per se, but rather its implications for climate sensitivity. In 2001, around the time of the IPCC TAR, there was a great deal of animosity towards any scientist or paper that argued for a low value of climate sensitivity (e.g. Pat Michaels’ 2002 paper). This leads to a very important question: Namely, what will happen to the exponentially growing climate change community if the sensitivity of climate to global forcing is small? Could the wish to avoid this question be the reason why our ‘official’ estimates of climate sensitivity have not improved since the Charney Report of 1979? Observational evidence for an iris effect is found in observations of tropical variability of upper-level cloud cover, precipitation, and the radiation balance, co-varying with natural variations of the surface temperature. Finally, there are a number of papers which simply report on satellite results for the radiation balance in the tropics over the 1990’s. Chen, J., B.E. Carlson, and A.D. Del Genio, 2002: Evidence for strengthening of the tropical general circulation in the 1990s. Science, 295, 838-841. 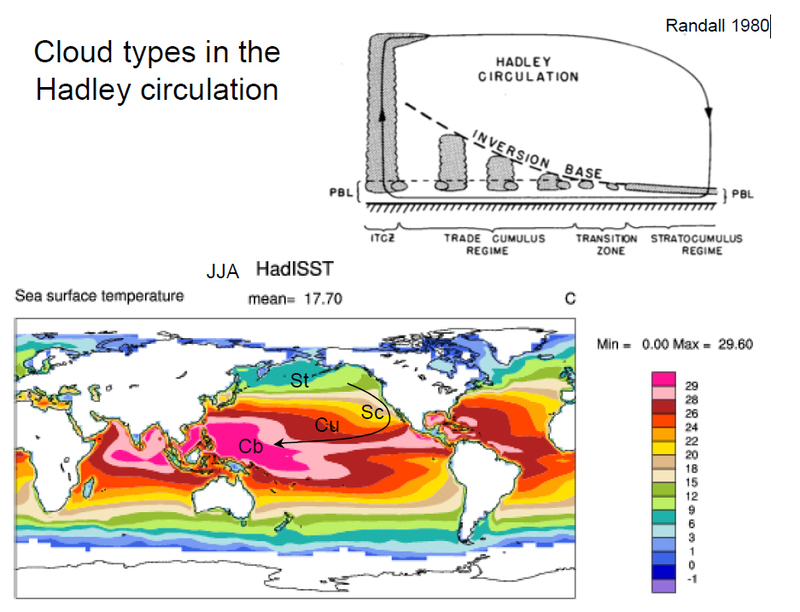 Wielicki, B.A., T. Wong, ….., 2002: Evidence for large decadal variability in the tropical mean radiative energy budget. Science, 295, 841-844. Cess, R.D. and P.M. Udelhofen, 2003: Climate change during 1985–1999: Cloud interactions determined from satellite measurements. Geophys. Res. Ltrs., 30, No. 1, 1019, doi:10.1029/2002GL016128. These papers all report anomalously increased OLR associated with tropical surface warming. Models, by contrast, fail to show such an increase. Presumably that is why it is referred to as anomalous. One can (though the authors don’t) infer a negative feedback factor from the observations, and it is at the high end of what LCH estimate. Moreover, the ‘anomaly’ is associated with reduced upper level cirrus. However, the same papers insist that what they see is not the Iris Effect, but rather the result of a change in the large scale circulation. However, there is something seriously wrong with this attribution. In brief, these papers are most likely displaying the Iris Effect. One objection to the idea of an iris effect is that it is not clear what the physical mechanism might be. An iris effect could result if the efficiency of precipitation within deep convective cloud towers increased with warming, leading to less detrainment into their anvils. This could occur if aggregation of convective clouds into large clusters is temperature-dependent. Aggregation is due to an instability of radiative-convective equilibrium, whereby relatively dry regions cool radiatively, resulting in local subsidence and further suppression of convection, ultimately leading to an aggregated state with localized convective clusters. The cooling of the dry and clear regions is expected to increase with warmer temperatures and hence promote aggregation1. In addition, in a warmer climate convective clouds may further be invigorated by enhanced latent heat release. 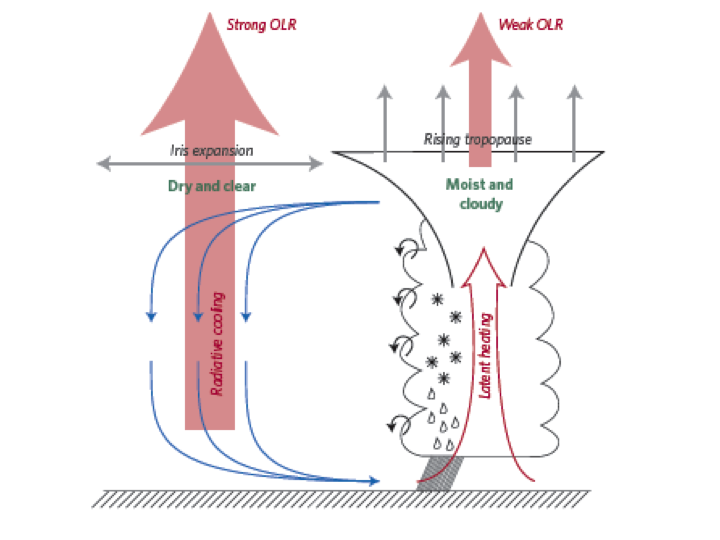 As larger convective clouds dilute less by lateral mixing they precipitate more of their water during ascent, and fewer large clusters can provide the necessary latent heating to sustain atmospheric radiative cooling (Fig. 1). Both cloud-resolving simulations and observations confirm that outgoing longwave radiation does increase as a consequence of a drying environment in more aggregated states. Shortwave absorption also increases, which tends to cancel some of the effect. All in all, however, we conclude that it is plausible that convective aggregation constitutes a negative longwave feedback on climate change — and to our understanding, the underlying processes are not explicitly represented in climate models. There is an increase in net radiation absorbed, but not in ways commonly assumed. While there is a large increase in the greenhouse effect from increasing greenhouse bases and water vapor (as a feedback), this is offset to a large degree by a decreasing greenhouse effect from reducing cloud cover and increasing radiative emissions from higher temperatures. Instead the main warming from an energy budget standpoint comes from increases in absorbed solar radiation that stem directly from the decreasing cloud amounts. When I first encountered the iris hypothesis, I bought into the hype that this had been ‘discredited’, without giving the whole thing much thought. The idea seemed counter intuitive to me. I did take a close look at the follow on paper by Lindzen and Choi (2010), which I reviewed at Climate Audit [link] – an interesting piece of blogospheric history. While I found a number of methodological problems with the paper, none of these struck at the core of the iris hypothesis itself. By 2006, when I submitted an analysis of tropospheric water vapor that investigated whether there was an iris in that, one of the reviewers pointedly questioned why anyone was still working on this issue. I subsequently withdrew the paper. Nevertheless, just because Lindzen et al. did not convincingly demonstrate their case does not mean the iris hypothesis is wrong. So the ‘consensus enforcers’ found it necessary to ‘discredit’ the iris hypothesis, and by extension Lindzen himself, since the reduced sensitivity threatened the ‘consensus’. You can see how this pernicious behavior discouraged scientists from investigating the iris hypothesis (I can only imagine how a grant proposal to investigate the iris hypothesis would have fared in peer review). I would love to find out how Mauritsen and Stevens came to have the idea for this paper, and why they bothered to investigate this ‘discredited’ hypothesis. The end result is a very good paper with new insights that has opened the door again to seriously consider negative cloud and water vapor feedbacks. I also wonder how this paper would have fared if it had been submitted to Nature Climate Change (consensus enforcing), rather than Nature Geoscience (which seems to do a good job editorially). Moderation note: This post is a companion post with Rud Istvan’s Modeling Lindzen’s adaptive iris. Sometimes we can travel the distance between theory and reality in the wink of an eye. As I understand it, increased forcing of the climate should increase precipitation across many continental interior regions. There’s a lot of water vapour around clouds, that absorbs a fair deal of solar near infrared, so it’s not just an albedo issue. Not at the top of the tropopause. I don’t see why upper level cirrus clouds would not have a local water vapour field larger than the visible cloud. They might, but it would be an awfully thin one. Look at the temperature there. Now look at the vapor pressure at that temperature. The end result is a very good paper with new insights that has opened the door again to seriously consider negative cloud and water vapor feedbacks. It does not go far enough. The cloud and water vapor feedbacks lead to more rain and snow and altogether, during warm times this builds the ice for the next Little Ice Age. There is Solar in from the sun. There is IR out that is more when earth is warmer and less when earth is colder. There is only Solar in, IR out and Albedo out. When it is colder, IR is less, when it is warmer, IR is move. Only Albedo can make up the difference. I have read this and read rud’s companion piece. It is very difficult to determne if the iris hypothesis is correct or not and what the nett overall effect would be assuming it does have merit. Once again however, it all illustrates that our knowledge of climate is much more rudimentary than it’s practitioners like to believe. Rumsfelds dictum rules and the unknown unknowns make a mockery of the certainties proclaimed by some scientists. It seems like a common problem with many ‘alternative’ theories, the fact that its very difficult to quantify how these processes impact temperature (or sensitivity). It seems that the nebulous term ‘internal variability’ is understood as little more than the residual after accounting for external forcings. Its almost as if the consensus theory exists because it is the only way to do the maths. Yes, it’s a drunkard’s search. The Dessler statement about withdrawal of his paper was also mentioned in a recent post. I still find it remarkable. Another nail in the coffin of the idea that consensus peer pressure has no effect on research. Who knows, without such dynamics this kind of paper might have come out years ago. I would hate to think that climate science is populated by a bunch of wusses. Thanks to you and Rud for very informative posts. We are trying, from very different perspectives. Judith is a climate science expert. I am a mere self educated Joe Shmoe ( on climate science). When we connect, that might become powerful to the general public. Please let us know. All I can say is this person is involved in modeling and that this person feels that if personal beliefs were told, there would be, it is felt, a subjection to humiliation and loss of income. That was communicated through tears. I am slowly writing a book, my only such adventure. would be a prominent chapter, when and if I receive permission. Best of luck with your book. But imagine how much more powerful that confessional would be if given in the first person by the modeler himself. Or herself. You couldn’t pay me to RealClimate. I can’t trust any source that has Gavin ‘hottest year ever’ Schmidt’s fingerprints on it. It’s Andree Dessler, and 2014 was the warmest year. Oh please, not the “2014 was the warmest year ever, by .02C, with a margin of error of .1C [5 times the ‘measurement’], with a 38% confidence level,” again. This is what passes for scientific analysis in the era of post-rational science. Gavin Schmidt said that there was a 62% probability that 2014 was colder than 2013. So cooling is the new warming? There’s a 23% chance 2010 was warmer. That’s your best ticket. NOAA puts 2013 at 6%. Hate to see you lose your money. If you think that backing a 3 to 1 chance is a sure fire winner, as an ex licensed bookmaker, I can only surmise that you have a severe case of climatology. There is no cure for attacks of irrationality. The race has already been run. 2014 held the crown for only 31 days. 2014 was far from the warmest year where I am. Honest question about the “hottest year ever”. I understand that 2014 is supposed to be slightly hotter then past hot years like 2010 according to GISS, but that’s now, with the most current adjustments. So is the GAT (Global Average Temp) for 2014 higher then what the GAT for 2010 was listed at IN 2010? Or what about 1998? what did GISS say the GAT for 1998 was back in 1998, compared to what they say it was now? I have no Idea where to find such data. JCH – will not accept data which does not support AGW theory. – even with an iris effect, the sensitivity does not become negligible. Ok, this is backward. The CO2 effect is almost negligible. The Iris effect is one of the reasons why. The measured CO2 forcing is 1/3 IPCC values. That’s almost negligible. There is no water vapor feedback (well, no positive feedback). Facts are facts and some theories on why the zero-to-negative-feedback exists are going to be right. The theories that there is positive water vapor feedback belong on the scrap pile. So, in the general Franco sense, The Iris Effect lives, barely. How about a link to that paper JCH? You have a bad habit of making a claim, then linking to something else. I linked to a direct quote made by Steven’s co-author, Thorsten Mauritsen. Their paper is linked in the article above. Aw, comon JCH. My companion post provided SI before/after images for four consequences, including precipitation and cloud feedback. You should read the paper and SI, or at least my simplified companion post, before proving your ignorance of both. Or, do you assert the paper’s SI is somehow false? If so, please clarify. I quoted one of the papers’ authors. Maybe you should email him. Well, how much sensitivity is negligible? For doubling that is 0.67°C. We will assume that is TCR. Given the 480 maximum CO2 rise the expected (but temporary) increase in forcing is 0.64 W/m2 or 0.17°C. But wait, there’s more… 400 PPM has proven safe for animals and good for plants. It is a wonderful CO2 level and much better than the plant starvation level 280 PPM CO2 the AGWers (the reality deniers) want us to return to The current 2.4 PPM/Y atmospheric absorption is going to be even higher, perhaps 4 or 6 PPM/Y when we run out of fuel in the 460-480 PPM range. But just to be nice we will use 2.4 PPM and 480 PPM. 33 years after we run out of fossil fuel we are guaranteed to be back under 400 PPM. 400 PPM is zero (0) forcing relative to current CO2 levels. ECS only applies when the CO2 is elevated for over 100 years. You could claim ECS induced warming of 0.1°C, but that is a 22nd century problem and the CO2 levels aren’t likely to stop falling at 400 PPM (they are trying to fall 2.4 PPM/year now). Just how much does zero (0) forcing make the temperature rise? Global warmers appear to think zero (0) is significant forcing. PA, CO2 levels globally are always in flux. During the NH summer they are much lower than the NH winter. Same for the southern hemisphere. However, there is much less land mass and vegetative coverage in SH. So who can this formula be applied accurately globally? Also the earth’s natural cooling mechanism- evaporative cooling will counter any warming from that CO2 formula. I am unaware of anyone else that is implying that the CO2 forcing in 2100 relative to today will be zero (0) °C. Do you think I am overestimating 2100 warming? That would imply warming will be less than 0.0°C in 2100. Warming of less than 0.0°C which isn’t called warming anymore. As for the Iris, probably real, but negligible. Maybe it could playout where warm water increases watervapor where skies are clear, clouds form releasing heat, precipitation falls where clouds is somehow conveyed to where the skies a clear, leading to drier clears skies area. Are the regions concerned generally clear or cloudy? Interesting, but what I’m more interested in is what happens in the northern hemisphere mid latitudes. I wonder how much of the land component of warming is due to greening and increased moisture. I also wonder what amount of moisture is due to increased precipition and what aquifer depeletion. While the tropical iris effect if probably localized and the preciptation is mostly over ocean, in the mid latitudes I bet it’s more broad. I bet the water increasingly makes it to lands, being thats where the cloud forming aerosols are, so we end up water increasingly precipitating over (dry?) land. We also move it around, less dry land means clearer skies and irrigation means more moisture where skies are clear. This is a strawman; it’s about cloud effects and not all effects put together. The standard view is to accept level relative humidity in a warming climate and that water vapor feedback gets you to 2C for ECS (eg see Stevens’ Ringberg talk). It seems the ‘goodness’ of a paper to RealClimate is based on its effect on maintaining high sensitivity. Stevens paper by my calculation showed a reduction of model ECS from 2.8C baseline to 2.2C using Iris1.0, or about 28% reduction. RealClimate says is doesn’t validate the Iris effect. Another strawman. Lets use the TeamConsensus term … it’s “not inconsistent with the data”. Let’s add that Dessler STILL claims that the 2001 Lindzen paper had ‘problems’. But I just went through the Lindzen talk, and from him its clear that most of the critics of his paper didnt understand his paper, and ‘anomalous’ observations were left hanging. Ahem … it doesn’t mean the GroupThinkers were right and Lindzen was wrong! I get the sense that Dessler knows this is for real, but is trying to minimize the implications and wants to minimize the vindication for Lindzen. Lindzen is still persona non grata for daring to disbelieve in high ECS numbers. JCH, in your desperation, you discredit yourself. You will notice that Mauritzen and Stevens are perfectly comfortable either linking to or commenting at RealClimate. If either if them commented here, I missed it. Bjorn Stevens presumably wouldn’t comment here because he was upset by my uncertainty monster presentation at the Santa Fe meeting. He does not like scientists criticizing other scientists. You are correct that sensitivity does not become negligible. JCH: It’s also worth pointing out what this study doesn’t prove. It doesn’t validate Lindzen et al.’s original hypothesis — in fact, it does the opposite – even with an iris effect, the sensitivity does not become negligible..
That is sort of interesting, in the same sense that “it’s interesting” that the theory of plate tectonics did not exactly validate Wegener’s original theory of “continental drift” because the moving tecta do not correspond exactly with “continents”. Nevertheless, Lindzen, like Wegener, was mostly correct. Without more accurate measurements of the “iris effect” (Mauritzen and Stephens supply modeling), we can’t tell whether the size of the “iris effect” is sufficient to render the CO2 effect “negligible”. A slight change due to a 1C warming over the large sea surface are where it is applicable, added into the changes I model in my “Earth surface sensitivity” calculation might indeed render the CO2 effect negligible. Now that the “iris effect” has risen an extra rung on the “ladder of respectability” perhaps there will be efforts to measure it in situ. Instead of simply labeling a hypothesis as discredited, why not propose an experiment to disprove it? They iris hypothesis is attractive for a lot of reasons. For one, it explains the relative stability of the climate down through the millenia. But however attractive it is, someone needs to make some real world measurements to check it out one way or the other. Jack, I guess great minds think alike! “why not propose an experiment to disprove it? 2. we are doing an uncontrolled experiment by adding c02. We are doing lots of uncontrolled experiments with the environment. Steve, was what Eddington did on Principe in 1919, taken to confirm general relativity, an experiment? Aren’t we hoping for Nature to provide the control, in some imperfect but meaningful sense? And shouldn’t we be scouring the heavens, so to speak, for this? Is there an experiment (involving a new satellite along with Argo floats) that could be designed that would provide reliable data on the iris theory and allow significantly improved estimates of climate sensitivity to be established? Isn’t this the kind of science that should be funded by our huge government agency establishment? Lindzen’s implication that the climate establishment doesn’t really want to find out that sensitivity is lower than modeled is pretty damning, but probably IMHO right on the mark. The establishment seems to prefer to “discredit” contrary theories by manipulating peer review and by beating up on anybody that dares to question the CAGW meme. Yes, it seems so. The question is: Why are they not treating Stevens’ paper with concern then? Regarding the data, there is now some higher frequency and more detailed data like CERES. Studies by Spencer, Dessler, Lindzen, Trenberth, Stevens and many others have used it. One might argue that short-term feedbacks and long-term are different, and so there is much still subject to interpretation, but I suspect that another decade of such high frequency data will be enough to work out many of these questions. Because Stevens included the magic words. ‘This in no way invalidate consensus climate science or supports the work of any climate skeptics’. The data is pretty clear that no tropical hot spot exist and no positive co2/water vapor feedback exist. SdP, the new Spencer analysis using UAH6.0 is important confirmation of lack of the troposphere hotspot produced yet again CMIP5. But that does not by itself show there is no positive WV feedback. It shows it cannot be as strong as models have it. They have upper troposphere relarive humidity effectively constant. Radiosondes and GPS occultation have UTrH declining, even though specific humidity (the actual WV GHG quantity) does increase. And there must be a weak net positive feedback for the observational energy budget TCR to be 1.3 versus pure Planck CO2 at 1.1-1.2 (pick your grey earth assumptions) and ECS 1.7, per Lewis and Curry 2014. I suspect most weak positive WV. My CE post on Monckton’s equation set out reasons the WV feedback is likely to be about +0.25 if cloud is 0, half of the conventional value. And when you plug sum of all f 0.25 into either Lindzen’s or Monckton’s equations, out pops a 1.7 ECS. Here is another study showing no positive feedback between CO2 /water vapor. One objection to the idea of an iris effect is that it is not clear what the physical mechanism might be. An iris effect could result if the efficiency of precipitation within deep convective cloud towers increased with warming, leading to less detrainment into their anvils. While there may be plausible meteorological mechanisms, it occurs to me that there might be biological mechanisms as well. Especially involving changes amount and/or timing of dimethyl sulfide (DMS) release into the atmosphere. Quite a few DMS-releasing planktonic species have (potentially) very sophisticated behavioral systems, that could easily respond in a very complex way to changes in pCO2, temperature, sunlight/shadow, and other conditions, differently by time of day as well as different patterns at many different time-scales. I meant “albedo”. I was momentarily blinded by images of a girl I used to know named “Iris” – she was a good looker. I think we are going to be surprised by the impact of microbes on climate. JW, I found this fascinating also. More of Judith’s uncertainty monster. For sure, Earth is a living biosphere. We have much to learn about that irrefutable fact. GAIA. You might find my first book on this interesting and provokative. But … but … Arrhenius … back radiation … the science is SETTLED!!! I WAS. I hadn’t even considered this kind of effect on the climate, though it seems quite likely in retrospect. You know, the climate really is an amazingly interwoven tapestry. I wouldn’t even mind the billion$ being spent on climate science if it weren’t for the fact that I think anything we discover will be in spite of it, and not because of it. Sunlight reaches the surface. The surface warms. Night comes. The surface cools. Clouds, GHGs in the way during the day, slow down the rate of heating. Clouds, GHGs in the way during the night, slow down the rate of cooling. Hottest surface will be away from the sea, more normal to the Sun, no cloud, minimum water vapour or other GHGs. Maximum radiation inwards. Coldest surface will be away from the sea, less normal to the Sun, no cloud, minimum water vapour or other GHGs. Maximum radiation outwards. Guess what? Seems to accord with fact! We already know that the climate system is stable from our being here. The earth has been through aeons of large perturbations and didn’t run off to some extreme to stay. Apparently it can oscillate but it returns, so the sensitivities have to be towards stability. This is with no data, just common sense. It’s a reason to discount alarm at the first sign of funding. There’s also le Chatelier’s principle: the system always kicks back. Including critiques of your hypothesis. Imagine Mann, Trenberth or any other consensus climate ‘scientist’ doing that. Some commentators on the Iris Hypothesis seem not to have read the paper in which Richard Lindzen set out his understanding of the basic GHG mechanism. See Figure 3 in the paper, Lindzen, Richard S. “Taking greenhouse warming seriously.” Energy & Environment 18, no. 7 (2007): 937-950. In the middle are the politicians with the authority to take action over climate change. Fighting for the attention of these pollies are climate scientists (on one side) and mega (polluting) corporations (on the other). In comparison, climate scientists have very little bargaining power and will probably lose. I made up an expression many years ago which is = = = “Those with expertise have no authority, and those with authority have no expertise”. Another way it can be summed up is in this cartoon . . .
Ah yes, the mega (polluting) corporations. And we of course know they are polluting because they produce CO2, which we’ve redefined as ‘pollution’. Recall that Max Planck Institutes have generous core funding and are at arms’ length of the government (which isn’t particularly Green anyway at the moment). With respect to climate change our government is very green indeed. In the government sponsored media every unusual rain shower is attributed to climate change. It’s the official policy of the whole parliament. I hope “they” don’t start referring to it as the Max Planck Den___r Institute as was recently done with Obama. I noticed that Trenberth got all bent out of shape that the term “Iris Effect” was used at all and particularly in the title. Is he the “Pope” in this field, or just one of the “bishops”? In my 30 years of working and publishing in science, I don’t think I have ever complained about the title of a paper or heard anyone else say it. That is between the authors and reviewers and the journal. Is he the “Pope” in this field, or just one of the “bishops”? Hard to say. He does have an actual background in the science, and seems to be an accepted authority. But Climate Science is the only religion where the sole necessity of ordination is convincing enough of the faithful you carry their sword into battle against the unbelievers. Cases in point: Cook, Lewandowski, Oreskes, Gleick, and Mooney, just to name a few. They rarely have any truly relevant skills, yet the faithful will treat their declarations of ‘Settled Science’, ‘Debunking’, ‘Denial Machine’ and less scientific claptrap as gospel from on high. Srsly, even people like Santer, Hanson and Mann at least PRETEND to have some relevant skill. Point taken. But I still give pretty good marks to M&S. Perhaps what the Max Planck Institutes did the the days they were named after Kaiser Wilhelm remains for some a potent warning of the damage infection from politics can do. I really, really wish more scientists talked about this. Most people think that science is explored on some neutral idealistic plane. That teams of people are out there investigating all sides of an issue. But the truth it — that takes money. Conclusions that produce positive results are more likely to get funding than those that produce negative, contrary, or God forbid, inconclusive data. (In fairness, who wants to hear, “I don’t know,” even when that’s what the data points to). But ALL of these results are equally as scientific — Yet, the way we fund science is not. Sadly, it seems like modern science is only valid if it is cost effective. ‘Obstructification,’ that’s the name of the game. The dominant source of variability in precipitation in the equatorial regions, on intra-seasonal time scales (< 90 days), is the Madden Julian Oscillations (MJO). It is characterized by the eastward progression of a large region of enhanced convection and rainfall (moving along the equator). This region of enhanced precipitation is followed by an equally large region of suppressed convection and rainfall, with the precipitation pattern taking about 30 – 60 days to complete one cycle. It is generally believed that MJOs consists of a large-scale coupling between the atmospheric circulation and atmospheric deep convection. When a MJO is at its strongest, between the western Indian and western Pacific Oceans, it exhibits characteristics that approximate those of a hybrid-cross between a convectively-coupled Kelvin wave and an Equatorial Rossby wave. Surely factors which affect the transmission of convectively-coupled Kelvin and Rossby waves along the Equator would play a much larger role in determining the overall (natural) variability of the intensity of precipitation, compared to the variability produced by anthropomorphic warming? Ian, we study the MJOs intensively, since they are the main source of predictability on subseaonal and even seasonal time scales. Simulating correctly the MJO is the holy grail of coupled atmosphere/ocean seasonal forecast models; models do a mixed-bag job at simulating the MJO. My colleagues Peter Webster and Violeta Toma are right now at a workshop at NCAR on the MJO. Long-term climate models don’t do a good job of simulating the MJO; how this could feed back to cause problems with cloud/water vapor feedbacks is unknown but almost certainly of some significance. I’m not sure how the MJO varies with natural climate regimes; perhaps someone has studied it (maybe I’ll take a look). In any event, I agree with you that natural climate variability (of which MJO is a key element) is a bigger factor in determining precip variability than AGW. I can think of some interesting scenarios how the iris might interact with the MJO. And how both might be influenced by behavioral changes in DMS production by plankton. One had only to look at Lindzen’s long publication history, his endowed professorship at MIT, and his list of grad students, to raise an eyebrow when people claimed the iris hypothesis was ‘discredited’ and began discussing his analysis of second-hand smoke effects. Poor Lindzen made the mistake of assuming he worked in a normal scientific field, where the goal is always to advance understanding. Starting with the Charney report, and probably before that, the field was morphing into something very different from normal science. 30+ years and hundreds of billions of dollars later, the Charney estimates of sensitivity remain unchanged, trapped by the field’s political (rather than scientific) nature. The lack of scientific progress on the single most important question for public policy is easy to understand; after all, many don’t think of the field as primarily focused on science. But that doesn’t make the complete lack of scientific progress any less tragic and wasteful. The spending isn’t the issue – the notion that some quantity of money = scientific progress is very, very wrong. Spending on research by definition does not have a consistent and/or high return. The issue is if the spending has been wasted in some part (not all) due to socio-political agenda rather than science. This is an issue I would be concerned about. Research that fails to prove your theory is not failed research, because it at least tells you what doesn’t work. Research that disproves your theory is almost as valuable as research that proves it, because it tells you that you need to go back and adjust your theory, and might even suggest what needs to change. Both are worth the money spent on them, though are rarely as gratifying as being proven right. But falsified research is a crime against science, because it not only doesn’t advance our knowledge, it often leads other scientists to waste their time researching theories that were never viable in the first place. Or even worse, leads them to discount their own findings because they don’t make sense according to the established ‘facts’. History has shown again and again that falsified research can take years or even decades to recover from. I can only hope that ‘Climate Science’ hasn’t done so much damage that Science itself loses all respect. The recovery from that could be measured in Centuries. So, if the IRIS effect is significant, we CAN expect more desertification? Would that trend be offset by the known ability of CO2 to enhance plant growth in dry environments? Jim2, as I understand Lindzen the iris effect is primarily over tropical oceans where afternoon/evening thunderstorms are practically a daily occurance. Not sure the effect would extend as much over land to influence desertification. So the ‘consensus enforcers’ found it necessary to ‘discredit’ the iris hypothesis, and by extension Lindzen himself, since the reduced sensitivity threatened the ‘consensus’. This statement comes right after the quote from Dessler, so, since written that way, I assume you are trying to link this conclusion with that text. But this conclusion does not necessarily follow from that text. In fact, to me, it seems that this conclusion, while possible, has not been proven by any statement in the post. Your statement, while written in language that conveys it as a truth, is not a proven fact – it’s conjecture. This post is Dr. Curry’s expert opinion on the matter. There is no absolute truth. Correction: There is no KNOWN absolute truth – generally speaking. Well, the actual words one chooses to use when writing do mean something. And that fact is actually made a point of in this post by reviewing Lindzen’s feelings toward the use of the word “discredited”. So to write a statement that says this IS the reason why this theory was “discredited”, means that either one is forgetting that one is expressing an opinion, or that one does not think this is an opinion, but fact. And if it is the latter, then, while there may be evidence that the author knows that supports that thesis, it is not presented here. On talk radio at the time the Lindzen Iris effect was being sold as completely destroying Al Gore and climate science. I sincerely doubt that Stevens or Mauritzen or Dessler thinks any new life has been breathed into the lungs of that crap pile. The “statement” beginning with “this is …” is yours, not hers. She uses the word discredited several times in the post. You have imagined a mountain from of a mole hill. Oh good grief, of course that’s my statement, not hers. Her statement is in my first post. My statement is a condensation of her’s for the purpose of emphasizing its thrust. Perhaps it is a mountain from a mole hill, but my problem with her statement is that the casual reader will come away understanding that it is a proven fact that the only reason Lindzen’s theory was ‘discredited’ was because the ‘consensus’ felt threatened. This has not been proven in this post and is an important point (to perhaps only me) because this is how myths are born and spread, and it feeds conspiracy mind-sets. It provides the folks who mainly frequent this blog one more reason to feel marginalized. If this is indeed the reason the theory was ‘discredited’, then support that thesis with something solid. Such support, if it exists, would be eye opening to many. Otherwise, consider that there may have been valid scientific reasons for being critical of this theory when it was first proposed. You and others have search engines at your disposal. Use them. Prove your point. […] my problem with her statement is that the casual reader will come away understanding that it is a proven fact that the only reason Lindzen’s theory was ‘discredited’ was because the ‘consensus’ felt threatened. I think it’s pretty close to that. Lindzen’s theory was disputed, but all the evidence goes to show that it was never “discredited”, people just started referring to it that way. But this conclusion does not necessarily follow from that text. Well, if you dig into all the material excerpted and linked, you can make a judgement call. In my judgement, the conclusion properly follows from the evidence. In fact, to me, it seems that this conclusion, while possible, has not been proven by any statement in the post. Depends on what you mean by “proven”. Have you actually read and understood all the papers mentioned in Lindzen’s slide show? For every criticism he lists, there’s a response. How good was the response? Did it properly answer the criticism? When somebody like Hansen, or Trenberth, uses the term “discredited”, are they expressing an opinion of the relative merits of the various efforts at science? Or are they just spouting propaganda, in yet another of the many examples of dishonest rhetoric from proponents of socialist solutions to “global warming”? And when people who aren’t prepared to judge the science parrot that term, what are they doing? This gets back to the subject of “scientific integrity”, mentioned in an earlier post: when some “scientist” like Trenberth spouts propaganda like “discredited” in, say, an Op-Ed in the NYT, is he guilty of a “failure of integrity”? That is something that someone like me (and I would suspect many others here), who does not work in climate science and is therefore an outsider, cannot properly judge. That is, if the term ‘discredited’ is being used among those climate scientists with the expertise to actually evaluate the work, then that term may indeed be accurate. But even if I read all the papers on the subject, I most likely won’t be able to form anything more than an educated layman’s opinion – no matter how smart I am. To actually participate in a field in the fullest sense, is quite different from just being well-read in the field. I think this is where many people fool themselves. Within the scientific field I studied of condensed matter physics, there are ideas that are discredited. One only need look at the history of development of superconductivity theory to find examples that some might label as such. But I think that very few people who are only well-read in the field would be able to properly judge or participate in a debate over whether that label was being used correctly or not. And some might well argue that, though they were in error, these theories were still helpful stepping stones to the correct theory, and therefore the word ‘discredited’ is too strong. To know the difference, I am suggesting, can sometimes be subtle and can escape the outsider. And of course all of this equally applies to the questions concerning whether Lindzen had properly answered his critics. ‘Discredited’, if you look at the definition of the word, is a word that should be used for research misconduct, not for a serious scientific paper that may or may not stand the test of time. All hypotheses are provisional. Neither Lindzen’s critics or Lindzen himself did much to further all this in the early critiques. It has been the subsequent papers (referenced in MS and also in my blog post) that are lending support to the hypothesis. Calling this hypothesis ‘discredited’ was propaganda attempting to discredit Lindzen, a prominent critic of the consensus on climate change. When you put it that way, I agree. Perhaps somebody ought to go through all the references to “discredited” climate science and determine whether actual research misconduct had been proven, or even alleged. And if not, perhaps we can build a “rogues-gallery” of people mis-using “scientific” authority for political purposes. Or perhaps people whose research has been denigrated that way can be invited to comment here. There is another problem though. What about “fringe” stuff (skydragons)? How is it to be designated? And how is the determination made whether a hypothesis is “fringe”, or just “radical”? BTW, it’s occurred to me that this tendency to denigrate science that doesn’t support (C)AGW may be a real case of Lewandowsky’s leakage. From the political fringe into science. You can reject the hypothesis or ignore it. The proponents of the hypothesis can modify it. so there is no clear action regarding hypotheses that don’t stand the test of time – they mainly become forgotten. Or they might be declared wrong or incorrect. Have you given up all pretense of objectivity? What is that you think would be counterproductive by posting these comments? Do you not think that you should address questions w/rt you biases? Wouldn’t that be inconsistent with your preaching about “integrity?”. Put on your big boy pants, Judith. Would you call the following rejection? Ignoring? Or would you call it discrediting scientists? JC Comment: nothing wrong with the quote from CA. However, I have completely lost my tolerance for comments that are trying to provoke someone or criticize someone personally. So try again and see if you can think of a good-faith way to introduce that comment into the dialogue. Anytime Joshua tries to use the quote ‘Put on your big boy pants’, you can be sure he’s about to spill a diaper load. Personally, when I see someone use the word ‘discredited’ I expect AT THE LEAST that it means that evidence has been put forward that indicates the theory can’t be true. It shouldn’t mean ‘this is unlikely’ and it should never be used for ‘I don’t like this theory’. Phlogiston is discredited, Piltdown man is discredited, Lysenkoism is discredited. The evidence doesn’t just fail to prove these theories, it actively prove them imposable. SETI is not discredited. Likely or unlikely, there’s no evidence to prove it one way or the other. Frankly, anytime someone uses ‘Discredited’ to describe something that hasn’t been proven false by direct evidence then I consider their opinion ‘Discredited’. John Cook, I’m looking at you. Phlogiston is discredited, Piltdown man is discredited, Lysenkoism is discredited. The evidence doesn’t just fail to prove these theories, it actively prove them imposable. What you’ve done here is to include examples of three very different cases under the umbrella of “discredited”. “Phlogiston” is a term from a long-abandoned paradigm. Although I’ve read Kuhn, who actually studied the chemical paradigm of that era, I certainly don’t understand enough about what the term “phlogiston” represented within its proper paradigm to know whether the “evidence […] actively prove[s it] imposable.” I very strongly suspect neither do you. “Piltdown man” has been very plausibly demonstrated to be an example of deliberate falsification. As such, it would count as “discredited” under the definition offered. “Lysenkoism” was a system that involved inappropriate external pressures on practitioners of “science”. As such it would also count as an example of “scientific misconduct”, and thus fall under the definition. The last two are of minimal interest, except for the many parallels in climate science. But the first is more interesting. What is a paradigm (sensu Kuhn), or a programme (sensu Lakatos)? When one of them is abandoned, do its primary postulates/symbols become “discredited”? How far does the paradigm have to go towards abandonment before this is the case? The use by defenders aggressors of the (C)AGW “paradigm” could well be said to be using the term “discredited” as a symbol of for sympathetic magic, a special case of wishful thinking. Thus, when they (including scientists who ought to know better) refer to the Adaptive Iris theory as “discredited”, perhaps they are actually just expressing the strong hope that the paradigm it’s part of will go away. The ethics of science is difficult enough, but IMO it’s impossible to define any system of ethics that isn’t internal to the paradigm. “Standards of proof” are paradigm-internal. The meanings of key terms, such as “mass” in physics (Newtonian→Einsteinian) are paradigm-internal. The nature of “evidence”, and what it “means” are paradigm-internal. So how could any system of “ethics” involved in prescribing right and wrong ways of handling such phenomena be other than paradigm-internal? Which, of course, highlights the question of what, if any, “ethics” exist in squabbles between paradigms? Well, Yes. Because I don’t believe all discredited theories are discredited in the same way. Nor do I believe that a discredited theory necessarily proves misconduct. Case in point, Phlogiston. As I understand it, Phlogiston theory was an attempt to explain combustion by theorizing an element or substance that was released from flammable materials during combustion. Limiting the supply of air restricted combustion because the air could only hold a certain amount of phlogiston before becoming saturated. This theory seemed to work in most experiments but failed to explain why some materials gained mass during combustion. Eventually it was proven that one of the components of air, Oxygen, contained mass and it was this Element combining with the burned material that formed combustion (essentially a process opposite of Phlogiston theory). As more and more evidence for oxidization was gathered that was incompatible with Phlogiston theory it was eventually discredited. So no misconduct, just wrong. Superseded by a superior theory. SCIENCE! Piltdown Man on the gripping hand was the definition of misconduct. An intentional forgery intended to bring it’s promoter fame and wealth. And while it’s eventual status as a fake was proven by newer and better dating technique and forensic examination, the reason it was subjected to such close scrutiny was because more and more evidence had been collected over the years that showed an evolutional history the Piltdown man simply COUNDN’T have fit into. It was discredited, by SCIENCE! which brings us to Lysenkoism. Possibly the best comparison to CAGW theory the world has seen in the last century. The thing few people realize today about Lysenko Inheritance was that it was a GOOD theory. It actually better explained evolution and how progeny could exhibit traits their parents didn’t poses then Mendelian genetics did at the time. It was just, like so many theories throughout history, wrong. And like all the other wrong theories in history like Phlogiston, Geo-Centrism, or the Luminiferous Aether, It would have eventually been discredited by the collection of opposing evidence… Except, that wasn’t allowed to happen in communist controlled Russia. Political manipulation, bias, cherry picking of data, falsified experiments, suppression of dissenters, omittion of inconvenient facts, all the traits that skeptics have come to associate with alarmist climate science, were used to keep Lysenkoism the dominant theory in the soviet union and it’s satellite states. And because of this the theory couldn’t be discredited… from within. what eventually did end is was simply that it didn’t work. Flood Resistant seed produced didn’t actually survive flooding any better then normal. Crops that were supposed to get 2 to 3 times the yield were only slightly better then the old crops, or even had LESS yield. Scientists trying to advance the field kept running into dead ends, and every time they faked the ‘right’ data they just made the next experiment that much harder. And all the while Mendelian geneticists in the west WERE getting results, and advances in their science like Mutation Theory, Lateral Gene Transference, Genetic Drift, and others were helping to explain the thing Lysenkoism had originally been needed to explain. But while it was effectively discredited early in the west it really didn’t end in the soviet east until it’s political defenders and promoters lost power. Only then was it truly discredited. There is not much in science that is ‘discredited’, unless a scientist committed research misconduct (which Lindzen most obviously did not). In his analysis, Dr. Schmidt, who studies climate for NASA, noted that the Lindzen-Choi paper was a valuable effort to attack a persistent question — how warm will a certain buildup of carbon dioxide and other heat-trapping gases make the world? “Even if it now turns out that the analysis was not robust, it was not that the analysis was not worth trying, and the work being done to re-examine these questions is a useful contributions to the literature –- even if the conclusion is that this approach to the analysis is flawed. This is a good statement by Gavin. Gavin is not in the class that has been claiming ‘discredited’, which is to Gavin’s credit. But it doesn’t take much googling to find ‘discredited’ coming from the voices of several climate scientists. And the softer version ‘thou shalt not use the word ‘iris”, exemplified by trenberth’s complaint of Mauritzen/Stevens using the word ‘iris’ in the title of their paper. In your own words, what were Lindzen’s initial claims about the Iris effect, and what is your word for the current standing of those initial claims? This is sufficient to conclude that Lindzen did indeed make the mistake of confusing his temperature indices, though a more accurate replication would need some playing around since the exact data that Lindzen used is obscure. Thus, instead of correctly attributing the difference to the different methods and source data, he has jumped to the conclusion that GISS is manipulating the data inappropriately. At the very minimum, this is extremely careless, and given the gravity of the insinuation, seriously irresponsible. There are indeed issues with producing climate data records going back in time, but nothing here is remotely relevant to the actual issues. My issue with the part I quoted was focused on the confidence expressed in why the word ‘discredit’ was used. You may be right – that it was used because a reduced sensitivity threatened the consensus. If true, I would like to know that. But for someone like me who doesn’t know the iris theory or the debate that has surrounded it, there is nothing presented here which helps me to come to that same conclusion. And I would further contend that, for example, the theory of cold fusion has been discredited, though I don’t believe either scientist involved committed research misconduct. So I think it can be reasonably argued that the word ‘discredit’ can, in some instances, be applied without intending to mean fraud. For an outsider looking in, it may be very difficult to resolve this. There are hypotheses and theories that are proposed and discredited all of the time in science. Eventually we will see if your “stadium wave” hypothesis is correct or not. And if not, if will most likely be discarded to the dustbin of history along with the others that did not withstand the scrutiny. Well I now see you disputed what it means to be discredited. We can’t go around redefining terms to suit our tastes so here is one of the definitions of discredit. Discredit: cause (an idea or piece of evidence) to seem false or unreliable. Just counting the direct effects of CO2 and the positive water vapor feedback would put ECS about 6, so we need negative cloud feedbacks to reduce that to a more reasonable number that agrees with actual data. To think that the 1979 Charney report has had such a prolonged influence on the greenhouse multiplier without intensive study is simply astounding! Is there no pride of work in the community of climate scientists? Is their no shame! The controversial ‘iris hypothesis’ proposes that the fraction of the dry and clear regions could increase with warming and exert a negative feedback: a larger extent of the dry and clear regions would lead to a less cloudy upper troposphere and hence an increase in OLR. I do not like the implications. While it suggests that warming will not “run away”, is suggests that the climactic effects would be greater and likely adverse. Dry gets dryer and wet gets wetter. I realized, this is for the tropics, where there is little land and the vast majority of rainfall is over the ocean. The opposite is likely true in more important regions and where there is land. While the tropical iris effect if probably localized and the preciptation is mostly over ocean, in the mid latitudes I bet it’s more broad. I bet the water increasingly makes it to lands, being that’s where the cloud forming aerosols are, so we end up water increasingly precipitating over (dry?) land. We also move it around, less dry land means clearer skies and irrigation means more moisture where skies are clear. 25-year average of rain rate. From Japan Meteorological Agency, Japanese 25-year Reanalysis (JRA-25) Atlas. So, maybe phytoplank trigger the whole thing. The cooling water under clear skies could increase phytoplanton production and produce the aerosols more cloud formation, just like trees causing clouds and precipitation. JC – The idea seemed counter intuitive to me. This simple concept has held back science more than any other factor. It was counter intuitive that all objects fall at the same speed. Intuition tells us that heavier objects fall faster. Most problems exist because the “common sense” solution actually aggravates the problem. For example, if you feed the poor, you get more poor people. The solution to poverty is thus not charity, but education. Teaching the poor how to feed themselves. The relationship between this paper and estimates of sensitivity are somewhat complicated. The question is.. Can we EXCLUDE sensitivities below 1.5C? How to do that? Well, ASSUME there is an IRIS effect. “Dear Andy, thanks a lot for a very nice perspective on our paper, which I truly enjoyed reading. I hope that in the future we can have an open-minded discussion on this topic, your 2006-experience points to the possibility that it has not always been like that. We should allow ourselves, and our colleagues, to turn every stone on this. I would like to point out that even with an iris-effect you can get a high ECS. Andrew Gettelman repeated the experiment with CAM5 and actually got over-compensation from shortwave, i.e. an increase of ECS. This is written in the paper. Thus, a sizeable ECS does not invalidate the core of the iris-hypothesis; that dry and clear regions of the tropics could expand under warming. It simply means that the original estimates of the impacts on ECS were overly simplistic, if not exaggerated. We go further and argue that if shortwave cloud feedback compensation is positive, then ECS is most likely above 1.5 K. We cannot address the upper bound in this study. Do people on this thread, GET THIS? The point of the study is addressing the lower bound. WHAT IF the Iris effect exists? THEN WHAT? Skeptics assert the existence of unicorns. And they argue, IF UNICORN, then your science is busted. So the authors take a look at this and construct a model with unicorns. Guess what? the science isnt busted even IF you assume unicorns. 1) Attempts to constrain ECS with shortwave cloud feedback alone (e.g. Sherwood et al. 2014) miss the possibility that real-world longwave feedbacks could lie outside that spanned by the model ensemble (the infamous unknown unknowns). This means that potentially these approaches can be reconciled with ECS estimates from the historical record. 2) It is exceptionally difficult to reconcile the high observed hydrological sensitivity, based on various independent but incomplete observing systems, with present modeling (see an excellent paper on this topic that I unfortunately missed citing: http://link.springer.com/article/10.1007%2Fs00382-014-2174-9). It is difficult to think of another plausible mechanism whereby hydrological sensitivity could be high. The puzzle we lay out in the paper is thus solvable with an iris-effect. That does not mean there couldn’t be any other solutions to the riddle. Concerning paleoclimate (I assume you refer to PETM), this was not a topic of our paper. However, since I do have a habit of torturing our model with high CO2 (http://onlinelibrary.wiley.com/doi/10.1002/2013GL058118/abstract) I of course also did this for ECHAM6-Iris. It turns out to have even more non-linearity than ECHAM6, such that at 16x pre-industrial CO2 temperatures have risen more than in ECHAM6. These are things I would like to understand better, but my working hypothesis is that the model simply runs out of high-level cloudiness so the iris-effect stops working at high temperatures. Answer– No- not based on current understanding of the system. There are far to many unknowns. So what? If it doesnt make the IPCC its a unicorn? Rather than a unicorn its something a scientist published and other scientists have attempted to build on. And something ideologues and other scientists have over-reacted to in both directions. some arent content with merely modeling unicorns…some dare to create them. Most of them are charlatans and frauds…. Mosh: why do you think there hasn’t been much progress in constraining estimates of ECS over the last three decades? There is Lindzen’s Iris effect, which was large. How else can he be understood? He suggested it would eliminate the enhanced greenhouse effect – even surface cooling. And then he trashed pretty much the entirety of climate science and climate scientists. I remember the talk radio shows. This was hyped like crazy as the death of climate science. Where in this paper is the abive brought back to life? Dessler – a model with 2.8C is reduced to 2.2C – I take him to mean worst case. Still likely greater than 2C. Then T. Mauritzen has a 2013 paper in which he finds warming eventually results in a higher ECS. Do you believe that forcing agents such as carbon dioxide can directly affect cloud cover and precipitation, without any change in global temperature? On net, i would find any zero effect doubtful. To me, it depends on the amount of water vapor in the dry clear column. But it is in the tropics, so I would say it’s likely that there is considerable water vapor in the tropical dry clear columns. Lindzen explains at least partially how it works. That it works is no longer a mystery. ECS is probably less then 1.0c for a doubling of CO2 concentrations from here. This just in: The RAPID measurements prove oceans make climate, and it looks like cooling in the future. Somewhere I read the AMOC cannot be slowing down. What practical difference would It make to land temperatures if the oceans were half a degree colder or half a degree warmer? My reading is they’re saying the GMST could drop by half a degree. Seriously, if the atmosphere is but one part of a mathematically chaotic Earth system, a very small change in the system’s energy distribution, resulting in ocean temperatures changing by half a degree, could result in unpredictable large changes elsewhere. Negative or positive. I remain hopeful that the system, although chaotic, has bounds within which we can survive. “Nov. 12, 2013: Billions of years ago when the planets of our solar system were still young, Mars was a very different world. Liquid water flowed in long rivers that emptied into lakes and shallow seas. A thick atmosphere blanketed the planet and kept it warm. In this cozy environment, living microbes might have found a home, starting Mars down the path toward becoming a second life-filled planet next door to our own. So what happened? Could it happen to Earth? I don’t know, but of course I hope not. What can’t be cured, must be endured, I’ve heard. Tony, I think water surface temperature would affect evaporation and transport of water to land. I think that would affect albedo through cloud cover changes, biological responses, and surface water vapor over land. Any ideas about the dynamics involved creating accelerated sea level rise along northeast coast of the US? Seems counterintuitive. “The coastal sea levels along the Northeast Coast of North America show significant year-to-year fluctuations in a general upward trend. The analysis of long-term tide gauge records identified an extreme sea-level rise (SLR) event during 2009–10. Within this 2-year period, the coastal sea level north of New York City jumped by 128 mm. This magnitude of interannual SLR is unprecedented (a 1-in-850 year event) during the entire history of the tide gauge records. Here we show that this extreme SLR event is a combined effect of two factors: an observed 30% downturn of the Atlantic meridional overturning circulation during 2009–10, and a significant negative North Atlantic Oscillation index. The extreme nature of the 2009–10 SLR event suggests that such a significant downturn of the Atlantic overturning circulation is very unusual. During the twenty-first century, climate models project an increase in magnitude and frequency of extreme interannual SLR events along this densely populated coast.” I am concerned they mention climate models. Differences are greater further north, less in the south. Yes vuk, but so what? I live 100 yards from he ocean. It’s temperature ranges from around 8 c in winter, it’s 12c at present and in a warm summer it might reach 18 or so. In a cold winter or warm summer that might change by a couple of degrees. How would a half degree change have any impact? 8 am temp here is 25 C. Forecast max 33 C. Dry season conditions. Very light winds. Beautiful one day, perfect the next. I feel your cold. Maybe you could find some of the missing heat. Half a degree in mid latitudes is almost unnoticeable, but differential is progressively greater with latitude, by time current reaches Iceland it is about 1C and even more further north. That makes lot of difference to formation and melting of ice in the Arctic, moving the Icelandic Low further south taking with it the Arctic jet stream. Tropics may stay unaffected but the temperate and the subpolar zones would drop much more than simple arithmetic of adding or subtracting 0.5C would indicate. During last Age Atlantic was only about 5 degrees cooler than the current ‘unprecedented’ high (load of rubbish) with the solid ice as far south as the M4. While heatwaves are to be expected where I live, and also the occasional chill, cloud cover accounts for most big swings of temp. I’ve just spent two nights without fire, thanks to cloud cover. The late morning is chilly, thanks to cloud cover. If Nino comes on and we cop clear skies and westerly winds over winter there may be unseasonably hot days followed by black frosts lasting twelve hours. Cloud cover gone! Who measures and collates temps is measuring and collating something, but not much. Global warming alarmist should look at the data objectively. If they did they would see AGW theory is not correct. Here is a study confirming this. Unfortunately, your cite shows water vapor increasing overall. Gray’s simple observation that air raised in cumulus formations is thoroughly wrung out, and is dry, not wet, kills the primary positive feedback in the models. It reduces ECS by 10X, from 3.0 to 0.3+/-1. End of AGW. Gray’s interpretration of how “reality” is with deep convection is wrong. Deep convection is dominatd by Cb not Cu. Cb reaches the Tropopause and spreads moisture laturally under it (any meteorologist will tell you of the massive Cb anvils formed and in such convection. It is this that moistens the upper Trop and NOT Cu build/decay. Moisture/Ci cloud thus affects the radiation balance as the GCM’s model. If all the moisture in a volume of moist air becomes ice, the air surrounding the ice contains zero H2O. Is the IR radiative absorptivity of that air volume greater or less when the total H2O is in the form of ice, compared with vapour? Have you any figures for say 300 mb? They would need to include the visible light opacity and the total IR opacity, in both directions, and for the H2O in the air volume to be totally solid, totally gas, and a mixture of both. I’ve had a look around, but I can’t find anything that gives good answers. What a confused argument, to a conclusion that doesn’t follow. Note that I’m not saying Gray is right, just that your attack on his thesis is dominated by straw men. No it is not wrong and because the data he has presented is confirming what he has said. This is from Vincent Gray. He is referring to CB not CU. Ci cloud has a greater IR emissivety than WV in that same layer of air. I know because I observed it more times than I care to mention whilst working as a Forecaster for the UKMO. We had the job in winter of monitoring road surface temps/conditions for much of the English Midlands, which necessitated viewing (dozens of) graphs of RST (road surface temp). If we had forecast either that that road site get close to 0C (either just below or just above) and it it did the reverse – we had to ring the relevent councils Gritting tteams duty officer (many often) in the middle of the night ….. All it takes is a patch of Ci cloud at ~300mb and ~-30C to make a difference of ~0.2C to a RST when near 0C. If well below then a diff of ~1C would be attained ( but this didn’t bother us as the overall frost was not affected. Believe me when I say this is Ci that you could still see stars through. Thanks. Have you got any figures relating to my query? The iris effect relates to the day, rather than the night, as far as I can tell. As a matter of interest, how much did road temperatures rise during the day when cirrus came between the Sun and the surface? It seems that it is claimed that thin cirrus clouds create warming during the day, but thicker cirrus leads to cooling. With your extensive experience, what was the increase in temperature during the day due to thin cirrus, and how much did it drop as the cirrus thickened? At what point did the trend transition from warming to cooling as the cirrus thickened? How did you measure the thickness of the cirrus? I have read papers on instrumentation used on aircraft to measure the total water content in cirrus clouds, but I cannot easily find the information I am looking for. Thanks for your input, but I am aware of the slowing of cooling at night due to cloud cover. I am also aware of heating due to anabatic winds, and relatively warm fronts, so the situation to which I seek measurements would apply to relatively still conditions on the ground. The presence of low level temperature inversion at low temperatures at night might also be another complicating factor, but I assume you took this into account. Anyway, if you can answer my original query, I would be grateful. Mike, you must remember that radiative exchange occurs both day and night so IR is back-radiated from Ci all the time, it is just that during the day it’s not measurable (on a RST thermo) due direct SW absorption. I did not directly measure or estimate Ci thickness, as I said, it takes relatively little to produce the effect (see stars through it). Tropical convection over ocean proceeds round the clock, though deep convection tends to get a “kick” often at night as the cloud top cools to space, this making the overall cloud parcel more unstable, and convection more vigorous. BTW: I found no ref to day/night in his abstract. Lindzen found a reduction of Cu with SST increase. This happens over land too. When vigorous convection occurs (more likely over higher surface temps) Cb will create anvil Ci, this has a “dampening” effect on Cu (what goes up must come down) and the Ci also reduces TSI at the ground, reducing convection. If Lindzen analysed his Sat pics via the vis channel then he would still “see” Cu beneath thin Ci … but when switching to an IR channel you would not – therefore the emissivety of the Cb Ci is STILL at work and the increased ocean open to space in reality does not exist. Sorry I have no ref for you re radiative opacity at 300mb. The net of ocean cycles explains the 64 year period of climate. When combined with the sunspot number anomaly time integral (which is a proxy for solar effect on clouds) and compared to a 5-year moving average of reported average global temperature measurements, R^2 = 0.97+ since before 1900. CO2 has no significant influence. Don’t know. Seems to be some room for GHG forcing temperature influence. Look PA, see the fit. Dan, this graph and your article shows a clear relationship. PA – you need to add AMO/PDO to the sunspot integral to get the effect. But the 0.164°C of 20th century CO2 warming does improve the fit. Because some simplistic analyses tell me that CO2 will have an effect on the amount of energy in the atmosphere I am open to a small but measurable CO2 warming effect. The real problem with global warming is the models and predictions are invariably wrong. Is there are testable prediction of future temperature from the sunspot+natural cycle theory? This theory to some extent looks like the stadium wave theory started from the other end of the stadium. The whole episode reminded me of a quote…from whom I didn’t recall and had to google. What I’d remembered was, “Science advances, one funeral at a time.” Attibuted to Max Plank. In reviewing Plank quotes, this one seemed appropriate as well. PA – The analysis at http://agwunveiled.blogspot.com achieves an R^2 of 0.97+ by accounting for both the time-integral of sunspot number anomalies (which is a proxy for cloud changes) and an approximation of all ocean cycles (which appears to be dominated by AMO and PDO). CO2 change was found to have a negligible effect in this analysis. In a completely separate assessment discussed in a separate section of the paper, it is proved that CO2 has no influence on climate. Explaining variations in surface temp by using a mix of subsets of surface temp is circular. “A high coefficient of determination, R2, demonstrates that the hypothesis is true.” No it doesn’t. The integration of SSN deviation from some value that represents a long term dynamic equilibrium is reasonable since the ocean heat capacity will do just that. Some account for a negative feedback should be included. In the simplest case this could be done by convolution with an exponential. That would correspond to a relaxation to equilibrium response. I’ve looked at this several times without finding anything conclusive. Much of the problem is that the massive “corrections” to SST are highly speculative and if incorrect make the whole exercise futile. The ocean, atmosphere, biosphere interactions are wickedly complex and virtually unquantifiable. We expend a lot of time, money and energy trying to simplify a basically unsimplifiable problem. Can’t find a lot to disagree with there. Can’t understand why anybody else would, either. I also found it rather counter intuitive. I also think it is stuck in the idea ( which is central to so much in climatology ) that we can best understand things by drawing linear trends everywhere. It is the detail, not straight lines, that will reveal if there is any real causational correlation. We should be looking at the tropics, this is where the energy budget is determined. We should be paying a lot more attention to the stratosphere which is a lot less noisy than the surface record.. The similarity that I pointed out in my article on tropical feedbacks seems to be getting some attention in a recent paper by Ferraro et al., though I have not had access to the full paper yet. I’m particularly unconvinced by hand-waving arguments that start with “in a warming world”. Climategrog – Apparently you scanned the agwunveiled paper a bit too quickly or perhaps you were blinded by preconceived notions. You say “mix of subsets”. It is unclear to what ‘mix of subsets’ refers. Only one set of sunspot numbers is used and the net of ocean cycles is represented by a single approximation (it appears to be dominated by AMO and PDO). The finding is that the long term trend since the depths of the LIA results from effects that identify with a proxy, the time-integral of the sunspot number anomaly. Ocean cycles neither add nor subtract significant amounts of energy but cause the surface temperature measurements to oscillate above and below the long term trend which is driven by the sunspot number anomaly time-integral. Because SST was not used, it is unclear what you mean by “massive corrections”. Adding nor detracting nothing to the ‘iris’ theory let us just observe that the towering monuments to water evaporation are the primary means by which the surface of the earth is and has been cooled for untold millennia. Notwithstanding our poor power to commit the very complex interactions of convection, latent heat energy and radiation at altitude to a neat set of physics formulas yet nature manages the feat quite nicely. It is without contention that this hydrodynamic cycle is the major component of earth surface cooling energy balance. Other than entertaining ourselves, what is this compulsion to detail the process in all its unmeasurable complexity. It happens, it is a fact, live with it. While on the subject, who could imagine that a tiny addition to the IR capture and thermalization process by additional CO2 to the dominant mix of water vapor in the boundary layer could do anything more than augment this unstoppable cooling energy transport effect. The idea that the well established water vapor positive feedback hydrodynamic cooling cycle should suddenly find new physics to become a warming cycle it not only illogical it is ludicrous. The iris hypothesis depicts a model of a self-stabilizing system. Our paleoclimate data don’t look like the system is self-stabilizing to me. It does to me. Within boundaries determined by (perhaps) continental configuration, and ecosystem behavior and evolution. The question is what role CO2 plays, if any. Also, from the abstract: We find that inclusion of such an effect in a climate model moves the simulated responses of both temperature and the hydrological cycle to rising atmospheric greenhouse gas concentrations closer to observations. I’m not sure how the leap from a model simulation to observation was made. They purposefully manipulated a model to try to produce results compatible with the iris hypothesis. I don’t have problem with models, but I would not call this evidence based on observations. You people sound like a bunch of vultures arguing over the scraps. Add up ‘iris’, GHG, stratus, ‘positive feedback’ and the answer is always the same. The net effect is negative feedback as it must be since it is and always has been the only effective cooling mechanism of the planet. Who could ever be confused to believe that adding a few per cent of CO2 IR capture to the water vapor capture would suddenly reverse the physics and cause any heating?